Design features in a structure allowing it to maximize the use of sunlight to heat interior spaces, but without any mechanical devices to distribute that heat throughout the building. Contrast with active solar heating. 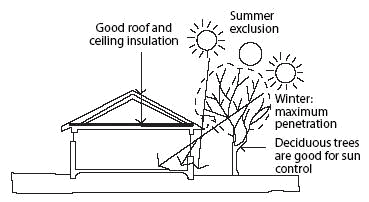 Passive Solar Heating and Cooling Manual, Part 1 of 4. Our company provides both photovoltaic solar solutions to produce electricity, and passive solar heating solutions for heating water. Top row, from left: solar panels and passive solar heating systems on traditional homes in India; Kuala Lumpur, Malaysia, cloaked in smog from fires in forests that are being burned to clear land for agriculture; women biking near a coal-powered factory in China. Passive solar heating techniques for houses--a combination of strategically-oriented glazing, fixed solar shading, thermally massive interior building components, and a well-insulated and airtight enclosure--are among the most cost-effective and technically simple approaches towards achieving low and net-zero energy design in cold and temperate climates (Balcomb 1992). Passive solar heating is used to keep the houses warm during the winter and strategically planned shading and natural ventilation keep the houses cool in the summer. This breakthrough shutter design, passive solar heating shutter application generates clean, renewable heat without changing the look of you home. It also ensures that each project fully explores eco-friendly building materials and techniques, with some recent examples being the installation of wood chip boilers, passive solar heating and lightweight cladding. Polished concrete floors also have a high thermal mass, contributing to passive solar heating and working well with in-floor heating coils. The detached, 75-square-metre facility is entirely off-the-grid and boasts renewable energy features, such as rainwater recycling and passive solar heating. The first step toward meeting that goal was designing their home to take advantage of passive solar heating and cooling. The home's long south-facing fagade with a ribbon clerestory provides passive solar heating and a three-foot overhang minimizes summer heat gain. As an added benefit, the pilot lights, combined with copious insulation in the walls and ceiling, and passive solar heating from a large window, keep the office/ shop room from freezing in even the worst weather.